Years ago, both of these services were founded to offer classroom services, which is a just what it sounds like. A small class of students would meet at a location sponsored by Kaplan or Princeton Review, and a trained teacher would lead the students in preparing them for their exam with lessons, practices tests, etc. Today, they’ve both updated and modernized their course offerings substantially. While those original classroom offerings are still around, they have added live, online versions of their courses, meaning students can be part of a course happening at planned times with an actual live instructor. They just have to sign onto a computer to do it. This is a real advantage for students in more rural areas or on small college campuses that wouldn’t have the necessary number of students to attract a full Kaplan or Princeton Review prep course. The other very popular option that you’ll find with these prep services now is a “self-paced” option. This means that you can sign on and off at your leisure, taking in instructional videos, practice questions and tests at on your own schedule. There’s no live instructor teaching material, but some students don’t care about that and are happy with on-demand materials. Depending on which package you choose, you may have the option to submit questions to be answered online by a test prep tutor as well. One thing you’ll notice among these two testing titans is how in many ways, they are very similar. Kaplan’s ACT prep class is 18 hours long. Princeton Reviews is also 18. Kaplan offers 15 practice tests for the MCAT. So does Princeton Review. There are many commonalities like this, and since the two compete so strongly for the same students, it’s no coincidence. Additionally, when there are differences, it may be hard to tell who is offering a greater value. If one offers 25 hours of instructional video and another 280 instructional videos (and they don’t disclose exactly how long they are), which is better? Does it even matter how many hours of video they provide? If you are a student who is realistic enough about your prep to know you don’t plan on sitting through more than 10 hours of videos before jumping in on the practice questions, you are way more focused on the quality of the videos than the quantity. My advice? Each of my comparison charts below will point out some differences between these services. If you find the key difference that puts you over the top for one or the other, that’s great! If not, I’ve included a link to a sample video for each as well as a link to their upcoming free events. Both Kaplan and Princeton Review put these events on with no obligation whatsoever as a chance to “sample” of their classes for free. The classes are a significant investment. In most cases, you’re going to do well with either one, but if you’re on the fence, take the time to attend a free event to get comfortable with the prep service you are leaning towards. As you are probably aware, there are so many options for MCAT prep, even just among Kaplan and Princeton Review, that it is hard to compare the two. MCAT testing is just so crucial to the admission process that they’ve tried to make every conceivable option available to students. Princeton Review says that they offer 123 hours of classroom instruction in their classroom option. Kaplan says that they offer: “More live MCAT instruction than anyone else,” but neglect to post the number of hours, making the claim difficult to verify. Regardless, there are a lot of specialized choices here, from Princeton Review’s Small Group Tutoring classes to Kaplan’s Summer Intensive in great locations like San Diego and Austin. Princeton Review offers up to 11 prep books while Kaplan offers 7. Kaplan includes 3 hours of tutoring with their “PLUS” plans while Princeton Review requires a tutoring package to get 1 on 1 attention. Princeton Review offers private tutoring or small group tutoring while Kaplan only offers private tutoring. So what is my choice for best MCAT Course, Princeton Review or Kaplan? This is a close call, and to some extent it depends on what you are looking for. Kaplan has some really high-end, “premium” options in terms of their tutoring and Intensive option. However, for the most MCAT students, I’d go with Princeton Review on the basis of their additional subject area review books and available group tutoring package. Click here to learn more about MCAT review with Princeton Review. * Not all options available with every package. Packages subject to change. See Kaplan or Princeton Review websites for current details. Numbers based on most common packages. 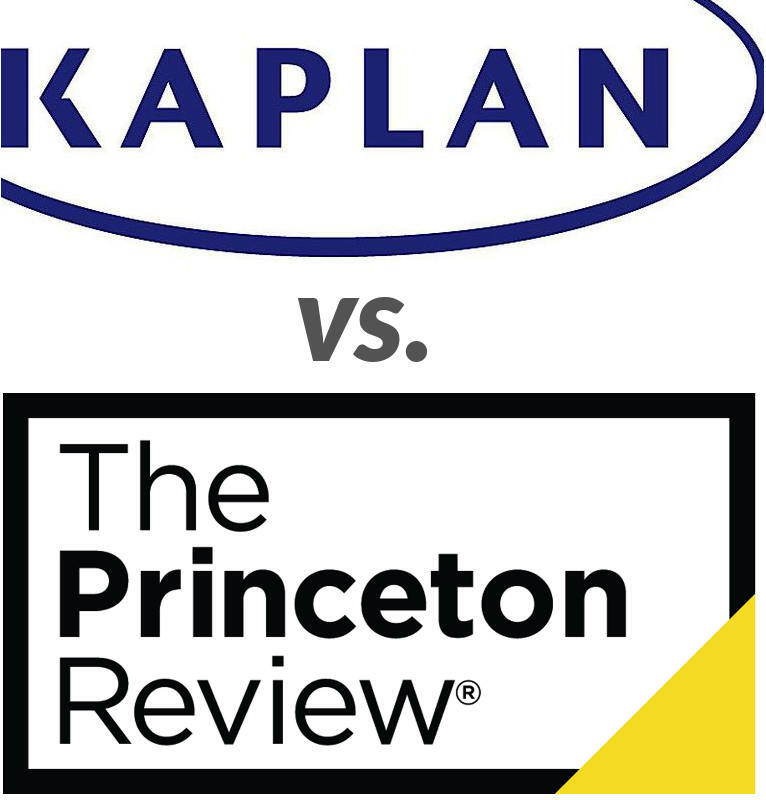 If you’re getting ready for law school, there are actually some pretty noticeable differences between Princeton Review and Kaplan when it comes to the LSAT. They’ve made different choices about what to emphasize in terms of the amount of study materials they make available, the evidence they’ve disclosed about their students’ results, and their costs. Princeton Review offers 6 proctored exams, while Kaplan offers 3. Princeton Review offers 130 hours of video lessons to Kaplan’s 70 hours. Princeton Review has disclosed the average score increase of their LSAT test takers, 12 points. Kaplan offers 3 hours of tutoring in their “Plus” packages, while Princeton Review requires a tutoring package for this. Kaplan offers 2 LSAT test prep books with their online and in person LSAT prep courses. So who has the best LSAT Course, Princeton Review or Kaplan? I’m giving the nod to Princeton Review here for a few reasons. First, there are the sheer numbers on the side of study materials. While I put quality over quantity, if you’re going to law school, you know how to study and will make good use of those extra repetitions. Second, the disclosure Princeton Review has made about their LSAT students making that giant 12 point jump is a big deal. I’d encourage you to read up on the methodology since it’s not a perfect experiment, but it’s just really rare to get that kind of transparency from a test prep company. Finally, I really like that Kaplan is offering the 3 hours of coaching, and I wish Princeton Review had that. However, Kaplan’s “Plus” packages are almost as expensive as Princeton Review’s tutoring packages. If you want the tutoring, for just a little bit more you can upgrade to a Princeton Review tutoring package and get 10 hours of tutoring. Click here to learn more about LSAT review with Princeton Review. * Not all options available with every package. Packages subject to change. See Kaplan or Princeton Review websites for current details. Numbers based on most common LSAT packages. Like the other tests, on the GRE / GMAT, you’ll see that these two have a lot in common. They offer almost the same number of practice tests, 180 hours of on demand video content, and a higher score guaranteed. Princeton Review does not currently have a classroom option. Kaplan includes 3 hours of online tutoring with their live packages. Kaplan includes 4 test prep books with their self-paced and live classes. So which is the best GRE Course, Princeton Review or Kaplan? For the GRE, I definitely have to award the prize to Kaplan. They have the more complete option here. I was disappointed that Princeton Review was missing some key options in terms of their prep books and live options that there’s really no reason for them to be without. Click here to learn more about GRE / GMAT review with Kaplan. * Not all options available with every package. Packages subject to change. See Kaplan or Princeton Review websites for current details. Numbers based on most common GRE packages and differ slightly from GMAT packages. The Kaplan and Princeton Review’s ACT and SAT courses are very similar in terms of their structure and options. Both courses run for 18 hours in the classroom. Both have a live online option that’s similar to the classroom option. Both include a lot of proctored tests, which is good for high school students facing their first “high stakes” tests. Princeton Review offers a couple of additional hours of tutoring with their Self Paced Plus Package compared to Kaplan’s. Kaplan includes their prep books with both their live and self-paced classes. Princeton Review only includes them with their live courses. Finally, Princeton Review has a really generous score guarantee. While Kaplan guarantees a score increase (before the course vs. after), Princeton Review guarantees specific numbers. On the SAT a 1240 or higher is guaranteed for all students. A 1400 or higher is guaranteed for any student that has previously scored at least a 1160. On the ACT, a 26 or higher is guaranteed to all students. A 31 or higher is guaranteed to all students that has previously scored at least a 28. So what’s the best ACT / SAT course, Princeton Review or Kaplan? In this matchup, I’m giving Princeton Review the nod due to their faith in their program via the score guarantees and the additional hours of tutoring that they offer. Click here to learn more about ACT / SAT review with Princeton Review. * Not all options available with every package. Packages subject to change. See Kaplan or Princeton Review websites for current details. Numbers based on most common ACT packages and differ slightly from SAT packages.